First Class, By Design - College Hockey, Inc. 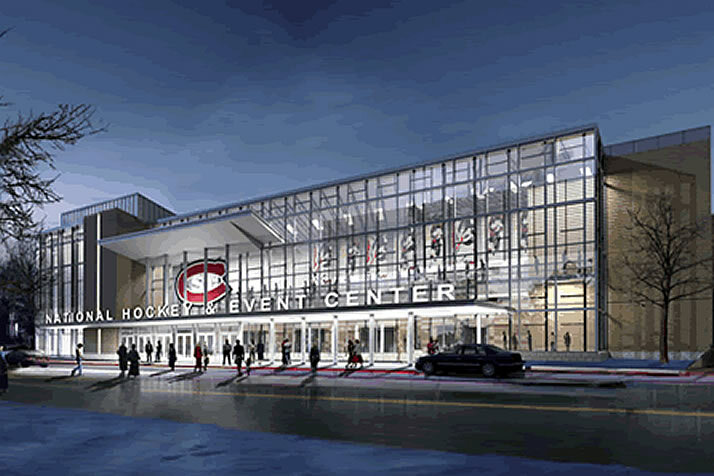 Arena renovations, construction continue to make college rinks state of the art. With more than a dozen arenas built in the last 15 years and many more renovated, college hockey programs have gone to great lengths to ensure that their players are spending time, developing and playing in state-of-the-art environments. That commitment continues with new arenas planned at Penn State and RIT, plus major renovations at several arenas, including Merrimack, Michigan and St. Cloud State. "When we built our arena 20 years ago it was the envy of most around the country," St. Cloud State head coach Bob Motzko said as they anticipate starting renovations in March. "The biggest thing that I'm excited to see from the renovation is the look of the building and the feel of the building and the warmth of the building." The result will be a much-improved fan experience at a rink that already boasts one of the best atmospheres in college hockey. What's more, St. Cloud State student-athletes will enjoy a revamped locker room and training facility that will rival those in the National Hockey League. Motzko and other leaders at St. Cloud visited the relatively new arenas at Miami and North Dakota to gather ideas for their $31.1 million renovation. What they found is a commitment to first-class locker room facilities that have become the norm in Division I men's hockey. Recently completed buildings like those at Bemidji State, Minnesota Duluth and Notre Dame all feature state-of-the-art training centers for their team, including weight rooms, off-ice practice and conditioning areas, training rooms, video rooms and more. Schools like Penn State and RIT that are adding new arenas will meet those high standards, and even add new wrinkles. These investments help schools attract the top talent, then give those student-athletes the best environment to play and improve while they are in school. "When we bring recruits in," RIT head coach Wayne Wilson has said, "they’re going to say, ‘Wow, they’re really committed to their program.'" That's a common refrain among young players and parents who have visited these constantly improving Division I facilities.